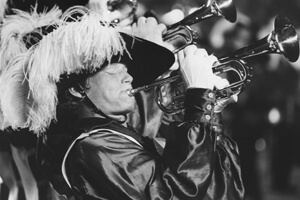 For America's 1976 Bicentennial, the DCI World Championships returned for the second consecutive year to Philadelphia, the birthplace of democracy. Both Championships were held at the University of Pennsylvania's historic Franklin Field, first opened in 1895 and deemed by the NCAA as the oldest football stadium still operating. In their sixth year, Blue Devils became the youngest corps to win the DCI title and the first corps to win all captions at Finals, introducing "Channel One Suite" and distinctive North tenor drums that looked like upside-down vent pipes on the decks of a classic cruise ship. The Madison Scouts took 2nd after dumping their entire funk show mid-summer, returning with the previous season's title-winning music, except for the opener of "Stars and Stripes Forever." In 3rd place, the normally symphonic Santa Clara Vanguard stunned fans with a full rock-out concert standstill, and the 6th place Bridgemen returned to Finals for the first time since 1973 with new yellow trench coats and a mass "faint" at the end of the show. Seneca Optimists, Capitol Freelancers and the Guardsmen made the Finals for the first time. The Cavaliers placed 5th in the 1976 World Championship Prelims, but fell to 7th in Finals. This was the first year of the corps' new, more "Cavalier-ish" look, with wide-brim hats and hot, non-breathable naughahyde vests covering their old satin blouses. The large feathers on the hats were captured in the design of the flags. Discount DVD offer ends Monday, Nov. 19 at 8:30 a.m. ET.